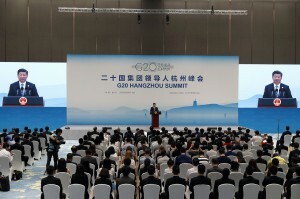 However, regarding global opinions on China’s hardline foreign policy stance, Endo provides his analysis that “In general, the world does not feel as threatened, and not even particularly interested.” He suggests the reasons are that: 1) After the global financial crisis, China’s economic strength and capital helped the world; and 2) With the Ukraine Crisis, Russia is considered a threat by Europe, and so that is where their attention is focused. Touching on US-China relations, Kawashima states that while the US had “some reservations” about China’s maritime expansion, those reservations were limited to those regions, and he argues that in reality, “The US and China are cooperating at the global level.” He notes that as a result, “Japan’s situation of confronting China’s hardline position on territory and sovereignty is not the standard worldwide,” stating that Japan’s stance against China is not necessarily widely shared by international society. Regarding US-China relations, Miyake writes that although the Xi Jinping administration talked about “a new type of major power relations” between the US and China, and carried out repeated summits since starting three years ago, since China has not responded to American requests for demilitarization in the South China Sea and for a stop to cyberattacks against US companies, America’s hope has changed to disappointment. Niwa first comments on the South China Sea issue: “The ‘nine-dash line’ that China arbitrarily established in the South China Sea is completely unreasonable, and in light of international standards this hardline policy deserves criticism.” Stating his opinion that “International society, including Europe and Asia, do not seem to be actively agreeing with Japan and the US in arguing for China to abide by international law with their clearly unjust claims,” he argues that “the current system of international summits should be fundamentally reformed, along with reconsidering international regimes,” and suggests restructuring the G7 into a G10 that includes China, India, and Russia.